Microsoft is overhauling its free webmail service, dropping the Hotmail brand it has used since acquiring the product in 1998, and adopting the name Outlook.com. 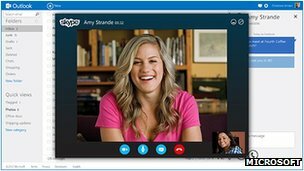 The revamped service will help sort messages as they arrive and allow users to make internet calls on Skype. It said the move would help tackle the problem of "cluttered" inboxes. The action may also be designed to win over users of Google's rival Gmail service. Microsoft said that in many cases email had become a "chore" because its users accounts had become "overloaded" with material. Its solution is to automatically sort messages into different areas to distinguish between emails from contacts, newsletters, package delivery notices, social network posts and other identifiers determined by the account holder. In addition it is taking steps to link the Outlook account with other services the user might have subscribed to. "We are giving you the first email service that is connected to Facebook, Twitter, Linkedin, Google, and soon, Skype, to bring relevant context and communications to your email," the firm's Chris Jones said on its blog. "In the Outlook.com inbox, your personal email comes alive with photos of your friends, recent status updates and tweets that your friend has shared with you, the ability to chat and video call - all powered by an always up-to-date contact list that is connected to your social networks." In what may be perceived as a dig at Google, Mr Jones added that the firm would not scan email content or attachments in order to sell the information to advertisers or others. He also announced that web versions of the firm's Office apps were built-in, potentially helping it counter competition from other web-based application suits such as Google Docs and Zoho Docs. 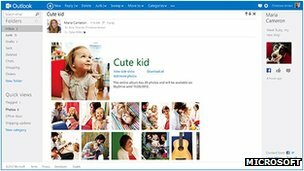 Outlook.com also links up with Microsoft's Skydrive cloud storage, allowing users to send photos and other documents via the service to avoid the risk of going over their attachment size limit. This could pose a threat to the rival Google Drive service as well as Dropbox, Sugarsync and others. Mr Jones said the firm had built a "brand new service from the ground up". But Matt Cain, an analyst at the tech consultants Gartner, played down the suggestion of a major leap forwards. "Outlook.com represents reverse-consumerisation - taking a ubiquitous business tool and recrafting it for the consumer market," he told BBC. "There really is no new technology here - the filtering tools have been around for some time as well as the social network integration. "What is new is the cleaned up user interface, and the marketing spin, and the tight integration with office web apps and Skydrive, and the forthcoming integration with Skype." Microsoft is offering the service in a "preview" mode for the time being and has not announced an official release date. While it advises users to upgrade, Hotmail subscribers can stick with the old system if they wish - at least for now. Those who do make the change keep their @hotmail, @msn or @live.com email address ending, but can also add an @outlook.com address to their account if they wish.